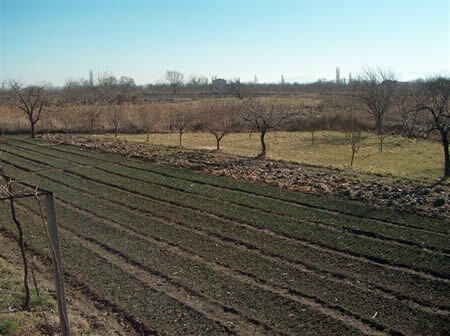 Agriculture: The areas and the distribution of the agricultural and the forestry spaces in the village of Vetren dol are as follows: from north to south: Peso pole-fields, , Oreshaka-fields, Baba Tepe-fields and vineyards, Chukura - meadows, vineyards, corn and rise fields, Cherkovistata - the old vineyards and Kutela-fields, gardens and grazing ground. In the forest these are the name of the areas: Elashkoto dere, Karmova cheshma/koliba, Golec, Dupkata, Gruyova skala, Oriahov dol, Ievata, Sechimek, Studeniat kladenec,Lesteniak, Bukov dol, Hadjiev kladenec, Kradjov kamak, Manastiristeto and down to Chepinska river. The total workable area of Vetren dol is 6 408 decares. The corn cultivation takes the biggest share. There were a lot of rye fields in the past, but today it is mainly wheat. Maize is grown as second and third cultivation. There are a lot of meadows - 500 decares. The orchard is developed in and outside the village. There are a lot of vegetable gardens. There are also some strawberry fields. The tobacco growing, which came here after the Liberation especially after the Balkan war in 1913 takes a big area almost 1/5 of the land due to the watering. In Turkish time still second best was the vine-growing. The old vineyards were high around the old settlement. The old vineyards were destroyed by the phylloxera disease and people began to grow the new vineyards in the sandy soil. American vines were grown here after 1919, but also a lot of local sorts. In the Turkish time they tried to develop rose growing, but unsuccessfully, because the wind took away the dew from the flowers. The cooperative farm yard in the northeast part of the village was founded in 1949. 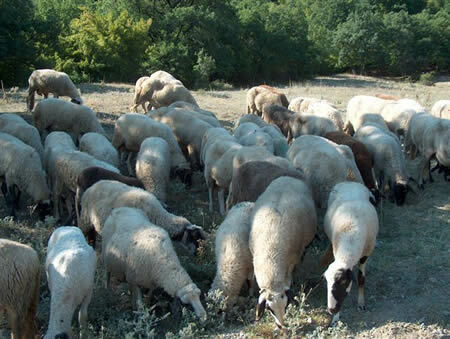 It is now owned by a new cooperative farm called Sunrise.The Vetren dol people develop the stock breeding due to the many natural and human made meadows with a total area of 1860 decares. They mostly breed cows, sheep and goats. Silkworm breeding was developed in the past.Vetren dol had about 15 000 decares of forest - now 12 500 decares - mainly beech, some oak, hornbeam, lime trees and some pine trees to the top of the ridge Karkaria. The village is also known for its poplar trees, which were more than 100 in the past. There were two lime kilns due to the limestone above the village, which no longer exist.